This process covers creating absences for staff on leave, and replacing them with other teachers so that their replacement teachers have access to their rolls and reports. 1. In Edumate, click on ‘Diary’ then ‘Daily Org’. 2. Click the ‘Staff Absences Register’ button. 3. Check an absence doesn’t already exist for the staff member using the search. To create the absence, click on ‘New Absence’. 4. Type all or part of the name of the staff member into the staff field (circled in Red below) and press enter. Specify the dates and time (make sure the start/end times cover the entire days involved). Put the away reason in if you know, otherwise simply select ‘other leave’ (circled in Orange below). 5. Click Save to create the absence. 2. Change the date (circled in Red below) to the first date of the absence replacement, then click Go (circled in orange below) to show the absence in the table. It should be highlighted red to indicate the teacher hasn’t been covered yet (covered absences will be green). 3. Hover over the ‘Batch Agent’ menu and click on ‘Batch Teacher’ (circled in Red below). 4. 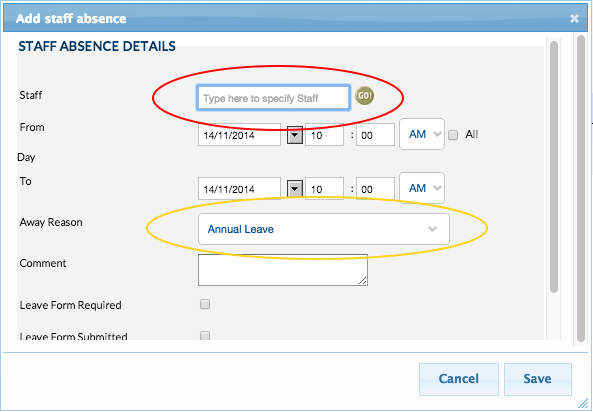 Select the Existing Teacher to be covered, the ‘New Teacher’ who will be replacing them, and the date range for which to apply the replacement (you may need to look up the dates on the staff absences register as per the ‘Staff Absence’ part of this tutorial at the top. Once you click ‘Replace’ (circled in Red below), all the absent teacher’s rolls and reports will be accessible by the new teacher for the time period designated.